Forest fires have the power to cause a lot of destruction because they spread very fast and reach extremely high temperatures. Depending on the size of a forest fire, it may take several days and multiple teams of firefighters to put one out. Firefighters sometimes go up in helicopters to dump specific types of chemicals on a forest fire to put it out. They may also dig a long ditch at the edge of a fire to keep the flames from spreading throughout a forest. Most kids know that a forest fire can be caused by a campfire that gets out of control, a lit match that is thrown into the brush, or even a burning cigarette that is carelessly tossed into the woods, but, did you know that a forest fire can be caused by a natural element such as lightening? The following websites will help you to learn more about the causes of forest fires, how they can be prevented and how some fires can benefit a forest ecosystem. Smokey the Bear Explains Forest Fires – Play a game, choose a story or select another fun activity from Smokey the Bear’s office. A Forest Fire Web Quest – Try this web quest and learn what a helitack firefighter is along with many other facts. Wildfire Safety Tips– Find out what can be done to prevent forest fires. Books on Wildfires – Check out a list of storybooks for kids about forest fires. A Fire Quiz – Look at a fire quiz that outlines the basics of forest fires. Facts on Forest Fires – Did you know that lightning can cause a forest fire? Discover other interesting facts on this list of ten. A Different Type of Fire – Learn about wildfires, how they start, and how firefighters try to put them out. The Facts Behind Forest Fires – Find out about the causes of forest fires, how to maintain a safe campfire and more. Forest Fires: Good and Bad– Consider some of the good and bad qualities of forest fires. All About Wildfires – Work through each page of this web quest and learn more about forest fires. Fire Information – Check out descriptions of the different types of fires. The Start of a Forest Fire – Look at some of the ways that forest fires start. FAQs Regarding Forest Fires – Read a list of questions and answers about forest fires and find out when they start, why they spread and more! Protecting a Home from Forest Fires – Consider a diagram of things a person can do to make his or her home less vulnerable to fire. Fire Prevention Printable Coloring Page – Decorate this page that is all about protecting trees from fire. Animals and Forest Fires – Find out where some forest animals go when there is a fire. Learning about Forest Fires – Follow the steps of this web quest and learn all you want to know about forest fires. Make a Fire Truck – Read the instructions and make a fire truck of your own. A Fire Prevention Activity Book (PDF) – Find your way through a printable maze and work on a ‘connect the dots’ exercise to learn more about forest fire prevention. A Glossary of Fire Terms – Learn the meanings of words that are related to fires. Facts Concerning Wildfires – Discover what causes wildfires and how families can be prepared. A Game of Putting Out Wildfires – Play a game that lets you put out the wildfires and save a small town. History of Fire – Work your way through a history of fire that explains the different types of fire and more. Campaigns for Forest Fire Prevention – Look through the various campaigns used through the years in efforts to educate people and prevent forest fires. How Forest Fires Begin– Discover how forest fires start and how they affect the animals living there. Causes of Forest Fires – Learn about common causes of forest fires and other important facts. Campfire Safety – Check out Smokey’s tips for having a safe campfire that doesn’t get out of control and cause a forest fire. Elements of a Forest Fire – Read about the progress of a forest fire and what starts one. Forest Fire and the Ecosystem – Find out how wildfire can affect the health of an ecosystem. Lightening and Forest Fires – Browse some information about forest fires that occur in the southwestern portion of the country. Eleven Facts about Forest Fires – A list of facts that reveals the number one cause of forest fires. Facts to Remember about Fires – Learn about some of the ways to put out fires. Birds and Forest Fires – Browse some facts on how various species of birds are affected by forest fires. Definitions of Words Related to Forest Fires – Learn the definitions of words such as cat line, cold trailing, and flanking along with others. 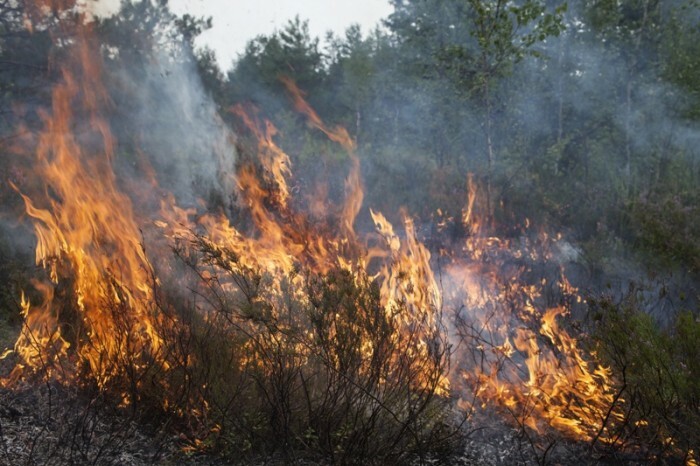 A Controlled Burn – Look at the details involved in a controlled burn and the benefits of it. A Wildfire Learning Activity – Meet a group of kids and test your knowledge with a quiz on wildfire safety!